DEBKAfile notes that CENTCOM chose to refer to the Persian Gulf as the “Arabian Gulf” which Tehran sees as a national affront. Wednesday night, Israel’s Prime Minister Binyamin Netanyahu warned that any Iranian attempt to interfere with shipping sailing through another vital regional waterway, the Bab al Mandeb Straits, would encounter an international coalition, including Israel with a full array of its military capabilities. Our sources liken the current climate surrounding a possible US-Iranian summit to that which led up to President Donald Trump’s Singapore meeting with North Korea’s Kim Jong-un. That too was preceded closely by a dramatic rise in war tensions, while quiet preparations for the big event continued without interruption. Well. The real reason why Israel is here folks. Is all about finance. Notably Iran is strong enough to resist corrupt ruling over finance. What is more interesting. Is world leader today. Will do anything for money. Even if it means putting good and bad people together for money. Or… Screw over the good people in this world. Simply for money. This really is. All to do with money. Actually quite incredible how Iran. Simply continues regardless. Maybe Trump is travelling with a plane full of dollars gold Nd diamonds? Even then the Iranians look beyond. Money. And riches. Which is why the Iranian currency is collapsing, the people are revolting, the truck drivers are on strike, and most of the country is chanting ‘enough of the Mullahs’. Baghdad Bob has been re-incarnated in this fool. They aware of what ? Currency collapse –its good for Iranian economy , which will dump Saudi riyal and Uae dinar or something like that. Israelis will be on stand by for what ? To put down the fire that will enguld the Hormuz or all the ME . Israel cannot put out fire from kytes , so it will do what start bombing the straits of Hormus together with US and British and other coalition of crazies. They should start communicating with each other , not put all the world at war. Oil futures will hiy 100 or more , and it will be good for whom -israel ? ?/ It rather doubtful , that it will .. Learn to speak english properly please. It makes it hard to understand what you are saying and puts into question what nationality you are, since each are polarized as to opinion differently. The reason the kites were not stopped was to prevent the death of individuals, not that the IDF did not have the capacity to stop all the kites. Satans Khomenis “islamic revolution” is about to collapse into a pile of shiite. I am true Iranian. We want destroy Mullahs to be free like Syria. We love also jewish people. They are so nice. They treat rebels for free. USA is our great friend, like Mr. Giuliani said in Paris. I was there because I love Iran and I want to free Iran. Stupid Iranians that do not revolt are losing a great chance. There are weapons conceiled inside Iran to help the overthrow of the regime. Revolution! Democracy! Lets kill everyone that don’t want a true democratic Iran. Vivre le MKO, vivre democracy! Behold I stir up Media against them, who do not value silver, and do not desire gold. Therefore, I will make heaven quake, and the earth will quake out of its place, because of the anger of the Lord of Hosts, and on the day of His burning wrath. 14And he shall be like a roving deer, and like sheep who have no one to gather [them]; each man shall turn to his people, and each man shall flee to his land. 15Everyone who is found shall be stabbed, and anyone who takes refuge shall fall by the sword. 16And their babes shall be dashed before their eyes; their houses pillaged, and their wives ravished. 17Behold I stir up Media against them, who do not value silver, and do not desire gold. Even the smallest countries in the world have missile firing ships. They could all sink tankers. Hell, a 5 in. auto-loading deck gun could blow one up with about 10 rounds placed correctly. Iran is offering no great feat by sinking a defenseless tanker. Plus, a single torpedo could take a tanker out also. So can they do it? – yea, easily. Would the rest of the civilized world krap on their heads? – yea, in a hurry. If Hormuz is closed, the Ayatoolas will eat Hormel meat on Death Row. It’s about time Iran should respond to Russian request for an airbase, alliance matters these days. you are stupid since the begining of this year every one knows that russia is not a superower!!!!! russia is a little power which try to exist as superpower.your coaltion with russia syria iranians is nothing than zero!!!!! So you think Israel is a superpower!!! Like a bunch of thugs bullying and terrorising the passing locals. These guys need to be messed up and made an example of. As a dirt bag goes down, one needs to watch for the desperate lashing out… Don’t stop ’til you finish the job. @DP Aug 2, 2018 @ 8:39 at 8:39……..Yep, as the Iranian Junkyard Dogs in Robes are Barking Louder they still have a Chain all Around Them. When these Dogs of Warning get tired tired and need to Eat and Drink all of sudden other Dogs right near them that have been starving and thirsty far longer will not just go after their Food and Water, but Tear them from Limb to Limb and as they lay dying they will see it is the same Puppies they once gave Birth and taught to Attack others but now their own Dogs will devour them as they try to run away with too many Money Bags Weighing them down. Barking won’t stop the Biting coming Iran’s Own Iranian Robes Destiny a New Persia Dawn Is Upon Them. “…Don’t stop ’til you finish the job.” Yes, keep flushing until all turds and skid marks are gone. I do not agree, Kim Jong-un is not under religious influence so he can change his mind. The Iranian Regime is not going change for anyone nor anything. They will continue to claim they are doing the Nations Business Banking of the Jewel of Persia’s Wealth, but they are Thieves putting the Persian’s People Oil Revenues into their own Pockets to do as they Please for their retention of Power. Behavioral Change will not happen Internally and Regime Change will not happen Externally. The Problem for the World and the Middle East is The Iranian Constitution stipulates that the Iran’s Islamic Revolution be Exported Worldwide. They will not stop trying to change others so the world has to change them or remove them. Unlike any other Nation on Earth the Iranian Robes Regime are doing everything within their Power to Export Chaos, Revolutions, and Terrorism. One can see it in Yemen, Lebanon, Syria, Libya, and Iraq. The Iranians are Funding Hezbollah Global Network of Radical Islamic Supporters to Stretch Terrorism in France, Canada, England, Africa, Asia, Central and South America. The Mullahs are Evil Men Vacant of any Decent Belief or Principles of Respecting Other Cultures, Nations or People. They misuse their Power of Persia Oil Purse like a Foolish Woman paying too much for Make-Up. So when called out on it she chooses to cause others instability, ignore International Law of Finance and decides she can Fund the Murder of anyone she chooses but they are mistaken. The ultimate Targets of Death to Israel, Death to America, and Death to Saudi Arabia Chants with Unbridled Enthusiasm of Pure Naked Evil is now coming from their own people Chanting Death to Ayatollahs, Mullahs, and Revolutionary Guards. There is no way the Ayatollahs and Mullahs will ever give up their Personal Deadly Sin of Excessive Greedy Reprehensible Acquisitiveness for Them, Their Families and Necessary Protection by employing Thugs to serve them. These Unholy Men Practice the Sin of Proud and Inordinate Self Esteem within their Haughty Spirit doing the bidding of Shaitan before the Iblis Fall from Grace in Heaven. Today, these are Religious Pretenders misusing the Persia Treasury for their own Personal Wrath to stirs up Strong Vengeful Anger and Indignation as a Tool to keep achieving their Pinnacles of Power. The Islamic Revolutionary Guard Corps share their Spoils while whipping and stripping the Persian People into Slaves taking Persia Great Wealth. Former President Obama reached out to these Thieves of Tehran and providing $150 Billion in Assets so Mullahs could ascend the Throne of the World’s Richest Men. Obama also did not call out loud the Mullahs’ Corruption so he could leave Office with a Deal for Obama’s Presidential Library of Vanity over the Persian People Humanity. But since Iran’s regime won’t change, President Trump will take Pages out of President Reagan Book that led to the fall of the Soviet Union a far Tougher Foe than Babies acting like Bullies in Robes. The United States has far Tougher Foes to Beat in England, Mexico, Spain, Germany, Italy, Turkey, Japan and Cold Financial Wars against USSR 1960s, Gulf Oil States 1970s, Japan 1980s, Iraq 1990s and now China. Who the hell is Iran compared to them????? President Trump along with the Arab Gulf States Coalition and Israel not just provide Words to show unison with the Persian people, but will use Religious, Financial, Covert, and Military Actions to Stand and free the Iranian People. President Trump has cleverly and ever so lightly is nudging and pushing the Iranian Regime into a corner like a Rattle Snake whereby it will have to Strike to Save itself. It’s the United States government. We just beat Germany and Japan. Who the hell are you? Just as President Ronald Reagan’s with Pope John Paul II provided Solidarity Protesters in Poland in the 1980s, as well as, Arming Afghan Guerrillas to take down Russians in both Countries until they left and change was forced upon them in 1990s removing the USSR and leaving a Smaller Weaken Russia now with a Chinese Siberia threat? President Trump will do as he pleases and wait it out from August to December without any Iranian Appeasement. As Iran’s People Descends into more Discontent the Gulf States and Israel will be imitating Iran Export of Initiating Revolution among the Persian People Confrontational Protests and exploiting the very Personal Wealth of the Mullahs against them. The Timing, Geography, and Global Alliances looking for a Worldwide Environmental Solution is Ideal due to the Dire Downward Spiral of the Economics within Iran Cities and Rivaling Rial’s Worthless Value. The Iran Regime thought it could exempt itself from its own Persecution by funneling funding of violence throughout the Middle East and Around the World. Now the Iranian is still too Blind to see all they have done is circle the Wagons and Surrounding themselves, their Families Future and can’t keep paying the Revolutionary Guards to protect in Tehran. China, Europe, India, and even Russia, will all exclaim and complain with criticism about Israel’s Bibi, Saudi’s U.S. Ambassador, Prince Khalid bin Salman and President Trump’s Wayward Winds of Wars, but will do absolutely nothing to help the Iran Regime. The World now knows from the Iranian Junkyard Mullah’s Loud Barking cannot release the Iranian Dogs of War anymore and its only Bite will continue to be into, exploiting, and stealing Bones from its own Persian People. When it comes time to send Cruise Missiles at every Mullah’s Palace, Rolls Royce Limousines, and Confiscating their Children’s Bank Accounts Investments abroad everywhere, just like what happen to Hussein and Qaddafi. The Ayatollahs and Mullahs will be riding Donkeys, Mules, and eating Goats and Swine again in Caverns, Tunnels, and where they will remain buried and dead as they deserve because they can’t change themselves nor their own Constitution that will end up sentencing their own execution. They will come to realize they will all die and it is just a matter of being Gone with the When of others Choosing? No Nukes For Kooks Wearing Robes Just Boxes To Be Buried In 24 Hours On Any Day And No One Will Play With Them Anymore because It The Right Time To Spank Them! Nonetheless, no one needs to change the Iranian Regime the Persian People will enjoy doing it with some little help from friendly neighbors. Unlike any other Nation on Earth the Iranian Robes Regime are doing everything within their Power to Export Chaos, Revolutions, and Terrorism. One can see it in Yemen, Lebanon, Syria, Libya, and Iraq. Sorry, the United Nations is what I really meant. The Americans now under Trump are doing a lot to stop the excesses of former administrations so if they can rein in the iranian scum, the world will be a better place for all. @Kilroy Aug 2, 2018 @ 15:04 at 15:04……….Nice Try, but it is not in the US Constitution to Export Terror and your ignorance can be plainly seen in an attempt to defend the Iranian Robbers Regime. America’s Goals for its Citizens and the World is within its Independent Constitutional Preamble…..”We the People of the United States, in Order to form a more perfect Union, establish Justice, insure domestic Tranquility, provide for the common defense, promote the general Welfare, and secure the Blessings of Liberty to ourselves and our Posterity, do ordain and establish this Constitution for the United States of America. Just like America had to react and defend itself after Pearl Harbor to change the Hate within Japan and Germany, the same Mission happen after 911, and it is time to change Iran back into Persia from 1935 and 1979. If you think otherwise you are badly mistaken. 1. The Time has come to put the Bull’s-Eye on Defeating Iran’s Ayatollahs’ Theocratic Police State is the leading state sponsor of International Terrorism. It is in the Iran’s Constitution to Export Revolutionary terror therefore, like the Military Elites in Germany, Japan and Italy the Confrontation Elimination of some mostly by their own Suicidal hands will Change and Save the Others that take their Place. The World will not care when Mullah’s that taught Hate goes away just like the Fascists Nazis and Militarists of Japan. 2. What needs additional attention are Lebanese Hezbollah to to remove their own also Terror Exporting Ring Financially, Diplomatically and Militarily through denial of Banking, Arms and Manufacturing of the Means to Export their Hate and Actions as funded by Iran. 3. The same goes for Hamas and Fatah that teach Hate in their Elementary Schools and Mosques with Radical Islamic Jihad, also supported by Iran. 4. Add in Blocking Iranian Funding to Afghanistan’s Taliban and disrupting, technically and psychologically, jihadists’ ability to indoctrinate, recruit. 5. The March to a Global Economy is now based upon the Cooperation of Partners including Israel, Egypt, Jordan, and other Middle Eastern, European and African Intelligence Agencies that have the ability to sustain Anti-Islamist Counter-Terrorism. 6. This will continue to include Economic Sanctions and other means, that Iran and their Radical Islamist Groups are forced into spending and raising the Costs for Countries including China, Russia, and Pakistan that think they can play a Double Game when it comes to Global Terrorism. America has always practice of turning Enemies that Americans defeated into Customers to and for the betterment and well being of their own citizens previously enslaved by these Robes Robbers. America will overcome this Culture of Hate with Superior Individual Rights, Rule of Law with Independent Judiciaries, and Innovative Technology within the Cultural Traditional Foundations of Abraham Principles, Persia’s King Cyrus Wisdom, and Religious Principles in the Torah, Bible and Quran. America is just leading the opportunities for these wayward Individuals to change or remove themselves from the plane within the Hate in their Hearts and Nuke won’t save them either, but will be their own declining decadence resulting in their devolution or self-inflicted societal suicide process. @Jeff Weiss Aug 3, 2018 @ 1:34 at 1:34…….You are welcome to avoid any posts you cannot read or respond as you please, nobody is stopping nor forcing you and try some substance when you can conjure up some over your own poor Form! @Cherenkov Aug 2, 2018 @ 8:55 at 8:55……………Two Wayward Nations that have been behaving badly and threatening all others really have no choice when everyone else around them it is time to retire or overcome and and no longer ignore them, the one global ecumenical nations of corporations now see the cooperation to change them and not One Dictators Family nor a Few Theocratic will stand in the New Pathway for Global Progress. The Five Permanent Members of the United Nation Security Council are also they Five Largest Arm Manufacturers in the World, and it is not North Korea nor Iran, or either of them. To accurately represent the world as it is NOW, England and France should be kicked off the Security Council and be replaced with India and Brazil. We will be waiting a lot longer for any kind of Iranian-US summit. Funny is it not……..The “Gulf” refers to the body of water known as the Arabian Gulf in Gulf Coast Countries, or the Persian Gulf as referred to in many other places. At the same time, using the term “Persian Gulf” is impolite at least for Gulf Coast Countries and nationals , whereas, Iran and many Iranians find the term “Arabian Gulf” offensive. However, the one thing it has Never Ever been called is “The Iranian Gulf”! 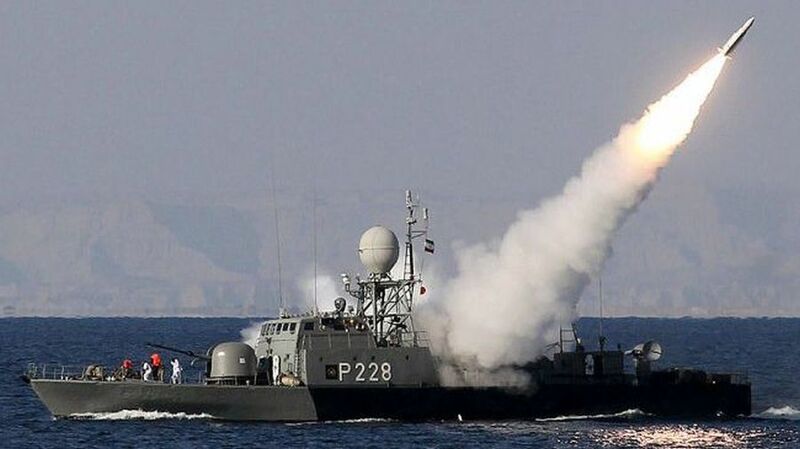 The American Navy once again does not care if Iran is insulted, they will just be watchful as Iranian Little Boats try and block the Arabian Gulf! When Iran returns to the name of Persia maybe it can be agreed to use that term again, until then, Go Fish….in the Arabian Gulf as Far as Eyes Can See, in Farsi! David van der Haggen Aug 2, 2018 @ 16:37 at 16:37……………….Provide some History you learned so we can see it, instead of being vacant in your own posts, no problem with your attempts to refute, augment, or provide any views you can muster, until then and when, you have not shown such abilities. Those photo captchas are very annoying. It takes a bit to download them which interferes with reading since the whole page must adjust for their space requirements. Peace. Let Muslims do battle against Muslims and just concentrate on keeping them all away from civization. Let Saudis and Gulf states lead the charge against their foe, Iran. The era of interfering in what is basically a Muslim – Muslim war should be brought to a close. Who cares if they blow each other up if that is part of their religious beliefs which the EU and UN honor and support in all contexts – even if that jihad spills over into the West and terrorists are killing our Western citizens/civilization. I say, defend our own borders and do not let Islamists of any sect get anywhere near civilized countries if they refuse to repudiate their violent beliefs and conquest. Iran, the land of Aryans, only seems to be going down. For that, a well done to an American president of substance. However, the trend from now until times of Mashiach is going to be increasing islamization and increasing strength to Ishmael. No returns to Secular Democracy will happen. Not in Iran, nor any more countries in the middle east. Hebrew h.o_ri_m occurs 13 times in the Old Testament… In all of these instances the English Authorised Bible has ‘nobles’ and in most cases we clearly have to do with dignitaries of some sort (e.g. the ‘nobles and rulers’, ha-h.o_ri_m we-ham-mega_ni_m, in Neh. 2,4,4,5,7)… For Arabic h.urr the dictionaries give (1) ‘free’; (2) ‘liberal, generous, frank, etc.’; (3) ‘noble’.. Ancient South Arabian has h.r, plural, ‘h.rr, feminine plural, ‘h.rrt, ‘freeman/woman’… then the special development represented by Geez h.ar(r)a_wi_, ‘soldier’, and h.ar(r)a_, ‘troops’, which do not seem to have left any traces in the modern Ethiopic languages.” (Francois de Blois, ‘Freemen’ and ‘Nobles’ in Iranian and Semitic Languages, JRAS, 1985, No. 1). iT WILL BE HAPPENING PROBABLY WITHIN THE NEXT FIVE YEARS. The ayatollahs are begging for it – and this time they will be caught with “skirts” even above their ears – exposing seldom washed, but always Lying a^*holes…. Wonderful, impressive, real hard work. The Iranian admiral in charge better get a glass bottom boat if he wants to review his fleet. Larga vida a Israel , y muerte a los enemigos de Occidente !!! !